First enable the “Timers” option in your “Account Settings” / “*Extra Features*” section. (Note: each Team Member needs to enable their own timer). When the Timer is enabled, a toolbar will appear at the bottom of your browser allowing you to start and stop the timer to keep time on tasks you are working on. The timer will continue ticking once it’s started regardless of what screen you navigate to. When you stop the timer, the recorded time will be automatically saved against your chosen task as a new time entry. If you are still working on the task, but have taken a break or are distracted with another event or task, when you return to the task you can restart the timer. To enable timer: Go to “account settings,” and go to the “Timers” section and click the Enable timers box. If you believe you will be billing clients you should enable the Timer right away. 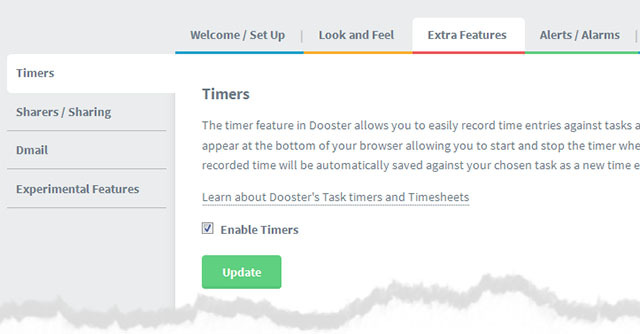 The timer is an extra feature which allows a professional such as a lawyer or a designer to track their time while working on tasks. If you are using multiple tabs: Starting a timer in one open tab won’t cause it to show as ticking in the other, but clicking start timer in the other browser would resume it. Using the browser’s back arrow may cause some oddities to appear eg the time seems to change or timer goes back to the Start Timer Button. But in the task itself the time recorded will be correct.